I bought a campaign dresser this past weekend (which is really exciting, as these are hard to find). 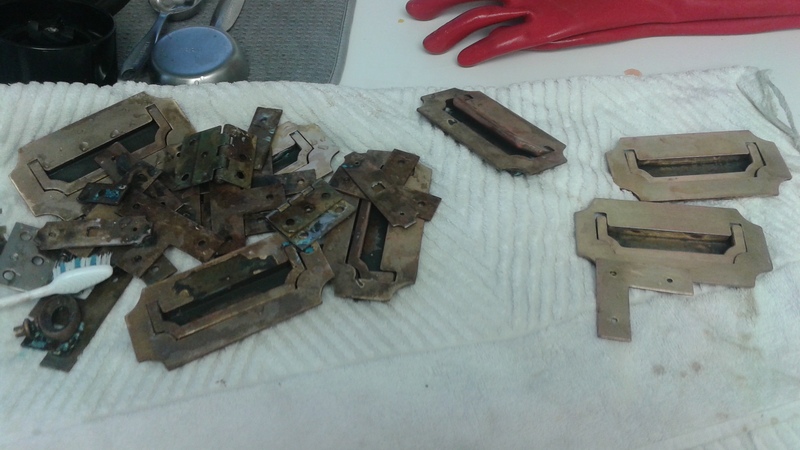 So, as I started to remove the hardware pieces, I began searching online for the best tips to remove the existing vanish and shine up these brass pieces. 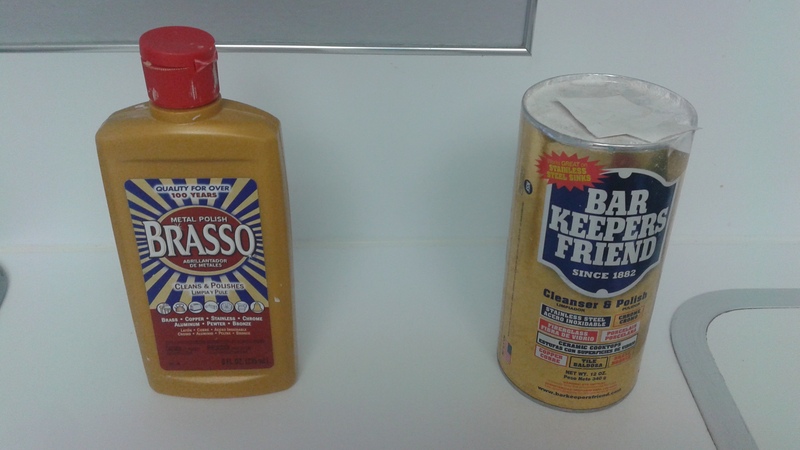 It was clear that many people like to use the product Brasso, so I thought I would start there. I removed all of the hardware, which was a lot more difficult that I originally thought it would be. Most of these pieces are attached with nails, so I had to do some major macgyvering to get them off. Glad that part is done!! First issue: some of the pieces were covered with paint, so I had to remove that first. In a large pot, I boiled 4 cups of water and put in ¼ cup of baking soda. I placed the hardware with the paint in this pot and let it sit in the boiling water for about 20 minutes. When I removed the hardware, the paint easily came off when I ran it under water. Second issue: vanish! According to many online sources, I needed to put the hardware in a “Brasso bath” –so, I literally put all of the pieces in a casserole dish and covered everything with the entire bottle of Brasso. I let them sit for about 20-30 minutes. 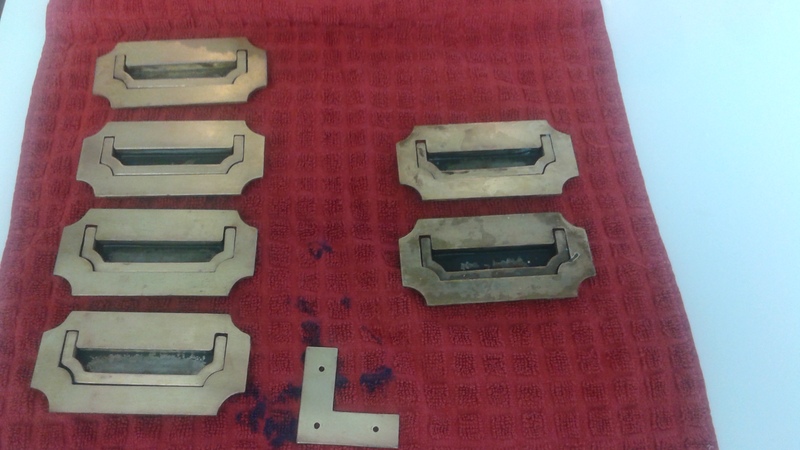 See the pictures below – the ones of the left are the Brasso pieces and the three on the left are the Bar Keeper’s Friend ones.. So, after the “bath” I washed them off and, to say I was disappointed was an understatement, this was not going to work. What to do? I had some Bar Keeper’s Friend under my sink that I decided to try. Equipped with an old toothbrush and some Bar Keeper’s Friend mixed with a little water, I went to work! WOW!! What a difference – this stuff worked! It was fast and effective – see the pictures below – you can see the “Brasso” pieces on the right side and the beautiful “Bar Keeper’s Friend” pieces on the left – big difference! I am excited to know how to handle these hardware pieces in the future! This will make a huge difference in the furniture pieces I select going forward and how I handle the hardware. I ordered some Rub ‘n Buff Wax to try out on some of the pieces of hardware that have a little more wear and tear – so, I will keep you posted on how this works next week. Next > How to Make Your Brass Hardware Pieces Really Shine! I love Barkeeper’s Friend. A year or so ago, I saw a workman trying to clean a HUGE antique window frame made of brass in a commercial space that was being re-done as an art gallery. I’ll bet that frame had not been cleaned since 1950! I saw him struggling, so went over and told him he needed to clean it with BKF. I promised BKF would make short work of the window frame and make it gleam as well. He took my advice, and went off to get the product from the grocery store. I checked back with him after a couple of hours; the window frame was glistening and the worker-guy was amazed at how fast BKF works and how well. H said he was really glad I stopped and told him about it. It also cleans copper like magic as well as being GREAT for scouring baked-on crud on pot bottoms. I’ll never be without it. Thanks for writing about it!